Jaden Smith just might win MVP of Rolling Loud SoCal this weekend, with his now-viral moonwalk garnering comparisons to the legendary originator of the iconic dance move, Michael Jackson himself. Smith, who took to the stage Saturday night (Dec. 16) in San Bernadino, Calif., won over the audience as he performed cuts off his new album, SYRE, with his epic moonwalking skills later going to live on forever after his high-energy set concluded. 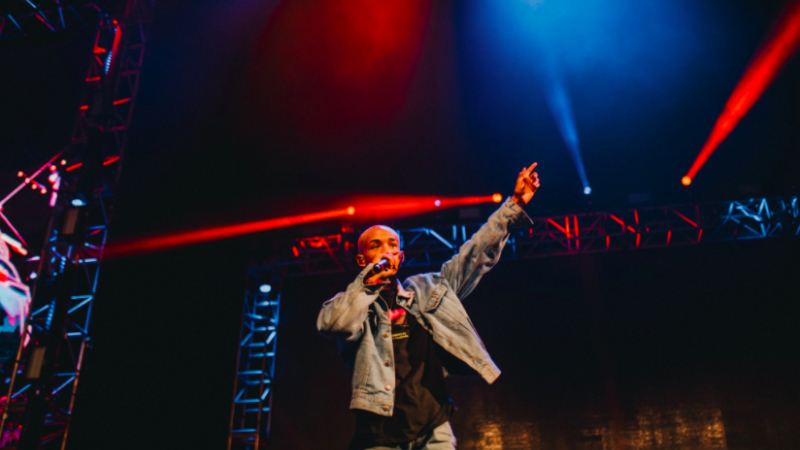 In addition to performing at Rolling Loud SoCal, Smith also took a moment to catch up with REVOLT backstage, explaining to host Marisa Mendez what Syre, the alter-ego character he named his new album after, means to him personally. "To me, Syre is the kid who always chases the sun but he's also, kinda like cupid," Smith explains. "He's like a modern cupid. He's a symbol of love and teenage love but most of all he's a symbol of teenage heartbreak and sadness. He's like a myth, a legend, like Zeus, you know. Syre exists in the clouds, on the mountaintops, in the sunset. He just represents lost teenage youth, lost love." Mendez then asks if fans will be learning more about Syre as Smith's creative journey through music and his accompanying visuals unfolds, with the 19-year-old quick to confirm he has much more in store. "You're going to keep meeting him through the series of my music videos and then through the film I'm going to release, the SYRE movie," he explains. "And then you'll meet the other alter-ego, Erys." Take a look at REVOLT's sit-down with Jaden Smith, and revisit his legendary moonwalk, in the clips above. REVOLT TV's livestream of Rolling Loud SoCal is currently broadcasting live from the festival through to midnight PT Sunday night (Dec. 17). Keep it locked here.